Looking across from the slopes of l’Alpe d’Huez it seems that you could almost reach out and touch the ski runs of les Deux Alpes. Dreams of linking the two resorts have been around for a long time. 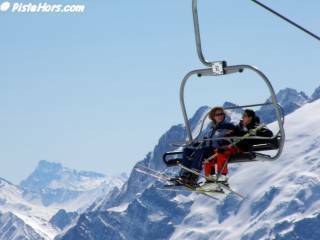 At its closest just 3km separates the south-west facing slopes of les Grandes Buffes to the east of Auris from the Mont de Lans chair lift. The opening of the massive Vanoise Express cable car in 2004 lent credibility to the idea that the Romanche Valley could also be spanned, linking these two giants of Dauphiné skiing. The skiing argument for hyper-domains is not convincing. To cross the the valley between les Arcs and la Plagne the Vanoise Express has to be relatively low lying. Skiing the furthest reaches of the domain takes most of the day with a good part of it spent on ski lifts. It is the marketing argument that is important. Following the launch, the new lift generated 4.5M€ in revenue and turned the formerly outlying Peisey-Vallandry into a boom town with a 15% increase in turnover. Lying on the crossroads of the two resorts it attracted both ClubMed and MGM, something that Bernard Chapuis of les Arcs lift company (SMA-STAG) has said was a significant factor in the resort’s recent success. Paradiski also helped the Compagnie des Alpes, the group that controls both resorts, to increase profits by a staggering 40% in 2004 and attracted high-spending foreign guests to the area’s shops and restaurants. However the recent picture is more mixed. Turnover has stagnated with a 3% increase from 2004 to 2006 although the last two winters have been difficult in the Tarentaise. Les Arcs has also reaped the most benefit from the new link. Could the same magic work elsewhere? On the 4th of February a project entitled “Clavans – towards new horizons” was presented to a public meeting at the town hall at Clavans le Bas, a small village to the east of l’Alpe d’Huez. It met with a mixed response from the Clavanchots and other inhabitants of the Ferrand Valley even though the mayor was apparently in favour of the project. The plan was to link Clavans and the col de Sarenne at 1999 meters with a cable car or gondola and install a couple of other lifts under the Chateau Noir. The main interest for Clavans would be property development, 3000 beds, and season jobs. News of the project soon reached the press and television and the reports got the speculators salivating. Situated at 1400 meters this community of just over a hundred residents has largely missed out on the tourism boom at the nearby ski resorts. The area still relies on small scale farming. Blanketed under snow for much of the winter the peace is only disturbed by helicopters from l’Alpe d’Huez picking up off-piste skiers at the foot of the Grand Sablat. Could sleepy Clavans become the next Peisey-Vallandry with buzzing bars, chic chalets and free spending tourists? Although there is a clear line from Clavans to the Mont de Lans chair lift at 1250 meters it is a long span of 4400 meters. It is possible that a cable car could have an intermediate station at Mizoen just above the Lac du Chambon. However the geology of the valley is unfavourable. The rock is unstable shale which would add considerable expense to any construction. The Torraval study of natural risks also highlights problems of rockfall, avalanches and landslides. There is another possibility cited in the plan. A link to St Sorlin d’Arves and the les Sybelles domain. The six communities that form les Sybelles have long had eyes for emblematic 3300 meter Pic Blanc, summit of l’Alpe d’Huez. After linking their ski areas via the Ouillon and equipping the Col de la Croix de Fer, one of the last wild mountain passes in the Savoie, with two chair lifts the councilors had initially agreed to class the glacier de St Sorlin as a nature reserve. Off limits to ski lifts. They later went back on their word but development would still meet with very strong objections. Could the high Ferrand valley and the Clavans development provide a back door into l’Alpe d’Huez? It would be a massive development creating the largest linked ski domain in the world but would also be close to the environmentally sensitive Lac de Quirlies. Other objections are the lack of water in the valley. The south-east facing slopes are the worst orientation for snow cover and would require snow canons to operate even during a normal winter. L’Alpe d’Huez is already meeting stiff opposition to equipping the bottom of the Sarenne run with artificial snowmaking. The steep slopes, unsuitable for moderate skiers and lack of reliable snow cover would also oblige Clavans to install a cable car or gondola lift to the Sarenne. Expensive to build and operate it is unlikely that the cash-strapped regional government would agree to the 3.25 M€ subsidy required to construct this lift. With les Deux-Alpes just 10km by road the argument of season work also looks thin. The link to l’Alpe d’Huez is also unattractive. After the col de Sarenne there are several km of relatively flat slopes to reach even the Chalvet chair as anyone who has taken the lower part of the Sarenne run will know. The road from Mizoen would also require an expensive upgrade. The problems finally appeared to be too great for Clavans. On the 1st of September 2006 a council meeting rejected the plan by 5 votes to 3. The councilors noted the strong local objections and that the plan for 2 to 3000 beds as well as the ski lifts would completely change the authentic character of the valley. So where does this leave the “Oisans Express” link? Recently l’Alpe d’Huez has concentrated on upgrading its high altitude skiing on the Glacier de Sarenne as an insurance against climate change. Les Deux Alpes also has renovation plans for the Diable and Jandri lifts as well as installing more snowmaking and improving the whole Mont de Lans sector. 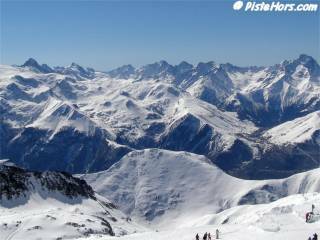 The SATA (Société d’Aménagement Touristique de l’Alpe d’Huez) and DAL (Deux-Alpes Loisirs) still want to improve links between the resorts. There is already a joint lift-pass with a direct shuttle bus twice a week but it is thought that any new lift will take a route from the center of Auris via Freney. At 4400 meters this is still possibly a lift too far. I see the vote was just 5 to 3 so it would only take a change of one councillor for the mayor’s vote to swing it. Elections happen, councils change, watch this space! It would be a truly awe inspiring ride across the valley. The addition of a bungee jump from the cable car directly over the lake would attract the thrill seekers. Interesting idea. 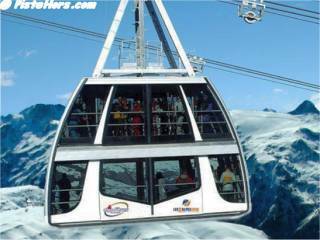 Do you remember that the Paradiski cable car attracted a team of base jumpers before it opened. The walked out on the wires - must have been scary stuff.